A Brazilian can be a resident of that South American country, a nut, or maybe a painful bikini wax. It's also the nationality of today's Nice Price or Crack Pipe VW, but is its price carnival-worthy? A wedge issue is one that divides a group, usually splintering it into smaller, less powerful blocks. Fortunately, yesterday's wedge car - the 1985 Lotus Esprit Turbo - didn't require such a divisive plot as it walked away with a decisive 75% Nice Price win, the second of the week. Another kind of wedge, however, is when your undies get all in a bunch trying to merge onto the Hershey highway. That uncomfortable situation is more accurately a wedgie, to use the medical vernacular, and is not something anybody usually aspires to have happen to them. Despite that, a whole bunch of the beach-goers in Rio de Janeiro purposefully do that to themselves in the name of fashion by wearing thong bikinis. And, for that great sacrifice, I salute them. And by salute, I mean fap. Fun fact, in Brazil they speak Portuguese. And I once heard that four door cars there were a sign of affluence so everyone drove two-doors so they'd look less attractive to kidnappers. I don't know how factual that is, but I do know that today's Brazilian-built 1981 VW Brasilia has but two doors, plus a pop up hatch in back, just in case you want to roll on the down low. Named after the Brazilian capital, the Brasilia was first introduced in 1972 as a new take on the People's Car. Engineered and predominantly sold in Brazil, it featured the platform from the Type I, and a body that was a tidy mashup of the German 412 and the larger local Variant. 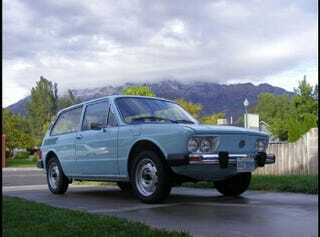 The steel body wrapped most commonly around that two-door wagon form, although a very limited number of five doors' were produced early on. While this was a proprietary product of VW do Brazil there's lots of parts that do come from Volkswagen's global products. The engine is a 49-hp, 1600-cc version of the company's ubiquitous boxer four, and ahead of that is a four-speed gearbox that wouldn't raise an eyebrow from a Beetle fan. Nothing has been changed on the motor – so says the seller – with the exception of the additions of electronic ignition and a real oil filter appended to the pump. Those will help with drivability and longevity, but do nothing about the performance which it should be noted could be best described as languid. Contemporary tests had the Brasilia taking about 5 seconds longer to reach 100 kph than GEICO supposedly takes to save you 15% or more on your car insurance. Of course with that kind of leisurely behavior, the smarmy gecko ought to be able to cut you an even better deal on this Vee-dub. That performance, or lack thereof, should at least provide time for contemplation of the car's other virtues, such as its accommodations. The cabin is ‘70s VW plain, and is also full of familiar pieces. The interior door handles and window winders are later Beetle parts, and the steering wheel can be found on any number of pre-airbag VW products. All that might make it seem like a parts bin compilation, but it all fits nicely into the clean but austere cabin. Equally somber despite some stripes, the seats look as flat as day-old beer, although below them - surprisingly in a car that's a Brazilian - you'll find full carpet. Outside there's what looks like a fresh coat of paint, the shade of Adriana Lima's dreamy eyes, and the seller claims the car is whole, having never been in a wreck. With only 48,000 miles on its clock, it sure hasn't had much chance to get in too many. The seller also says this is one of only five in the U.S., and while that's a claim that I can't verify, I do know that there's another one living about two miles from my house right this very moment. Come to think of it, these things can't be that hard to hotwire. As it's now 30 years old, registering it shouldn't be an issue anywhere outside of the Golden State, although what with the current climate for illegal immigrants, its current Mexican registration could be a hindrance. Arizona residents beware. Should you want to make it legal then you'll need to come up with $12,000 to get this Brazilian. For that, you get both a car that will be the hit of any Bug-in, and constant thoughts while driving it of a land where your food is served on a sword, and even your mom wears a thong on the beach. So what do you think of twelve large for this South American, would that make this one smooth Brazilian? Or does that price over the bikini line? KSL Classifieds or go here if the ad disappears. H/T to mzs for the tip!